Dishes by Doe | Stevey W.
After decades dedicated military service, Stevey found himself homeless. He came to The Doe Fund in 2009 searching for purpose and an opportunity to get back on his feet. Stevey’s interest in food stretches back decades to when he served as an executive chef in the military. He decided to go back into the kitchen we he joined The Doe Fund, rediscovering a passion for cooking that inspired self-confidence and set him on a path to success. 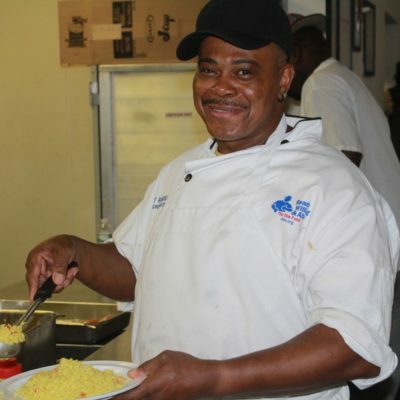 Stevey is now working as a full-time employee of The Doe Fund’s culinary arts program, and continues to love his job. He is grateful for everything The Doe Fund has provided him, both professionally and personally. Stevey hopes to retire soon but would like to continue his culinary arts journey by opening his own food truck serving made-to-order American classics. Stevey is proud of everything he has accomplished professionally, but he takes even more pride in the relationship he has begun to build with his two children. In both his military and civilian roles, Stevey has devoted his life to serving others, and we are honored to call him a member of The Doe Fund’s culinary team. His continued perseverance and dedication to personal growth is an inspiration to everyone he encounters! Dishes by Doe is a social enterprise by The Doe Fund. Contact us at 718-628-3214 or catering@doe.org.